Dr. Young really helped put me at ease ​Anastasia M.
Dr. Timothy Young, a native of the Puget Sound area, has lived near Issaquah most of his life. He attended Issaquah schools before going on to the University of Washington. 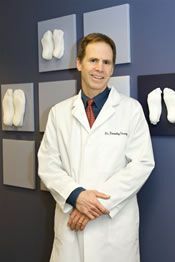 He received his DPM degree at the California College of Podiatric Medicine, and continued on with his foot surgical training and residency training at New Berlin Memorial Hospital in Wisconsin. Having returned to Issaquah to open his clinic, Dr. Young lives in the local area with his wife Kari and their three children. When not practicing medicine, Dr. Young enjoys spending time with his family and activities which include snowboarding, boating, wake boarding and fishing. He keeps fit by jogging, mountain biking, hiking and walking. He also has his private pilot license with a float plane rating.